This is Trini Gulab Jamoon. I say “Trini” because I have had gulab jamoon in Indian restaurants in the UK and from friends in Barbados etc where their gulab jamoon was more like our ras goolah. Fried balls served or soaked in a syrup. This is fried balls of rich dough yes, but glazed with sugar, not soaked. Traditionally made in elongated ovoid shapes (see Trini Gourmet’s recipe or this picture from my brother’s wedding boxes, for the more usual shape). However, since I am not good at that shape, I make little balls. Cute and easy to eat. This is my mother’s recipe as given to us all. Mom makes a really rich soft gulab jamoon that’s nothing like kurma. Which is why I never understood when people would call gulab jamoon the “big kurma”. Kurma is doughy and can be either thin and crispy or big and fluffy. Gulab Jamoon is rich and dense and sweet even without the sugar glaze. But the connection is there certainly, so doh mind me and my pickiness. It is still fried dough with sugar all over it. Of course this isn’t entirely traditional as it uses an icing sugar glaze rather than the regular sugar paag used in most indian sweets. But, trust me, icing sugar glaze dries faster and more evenly. Just a different look. 1. Mix condensed milk and margarine with spices until mixture is smooth. 2. Add 2 cups of flour and mix well and then add the final cup a little at a time in case all is not needed – it is important to keep the dough soft and not dry and cracking. Note: flour content depends on humidity etc – I used a little less in Scotland, whereas you usually need the full amount in T&T. Do not add any water and knead well and cover with a damp cloth to keep it from drying out. 4. Make sugar glaze by mixing together half the icing sugar and 1/4 cup water. Add more water and icing sugar as needed. It’s easier to glaze and quicker to dry when the glaze is hot/warm. 5. Dip the gulab jamoon into the glaze and lay out on baking sheets or waxed paper to dry. This entry was written by Chennette and posted on February 4, 2007 at 11:07 pm and filed under food, recipes, Trinidad and Tobago. Bookmark the permalink. Follow any comments here with the RSS feed for this post. Post a comment or leave a trackback: Trackback URL. I like the name of the recipe. Gulab Jamoon. tastes so good without glaze and hot! ok, what’s kurma?? the first time i saw them the trinidadian way was through sarina. was news to me…. both yours and sarina’s look so good. will have to try making them this way. i just don’t associate them (yet) as G J without the syrup! 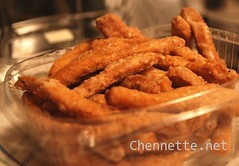 This is the crispy kurma here. But the soft kurma is also made in Guyana and called methai (or something like that) and is usually cut off a long fat tube of dough then fried, and sugared. But flavoured with clove and cardamom as well. yes – mom has made an almond kurma – the soft kind – so good. The texture of the soft kurma (not the gulab jamoon) is almost like a challah bread I think – or a brioche (at least the way Mom makes kurma) – what say you Niki? you must try the gulab jamoon covered with chocolate glaze and rolled in sprinkles and also the stuffed gulab jamoon; Lilandra likes them stuffed with pitted prunes and I like them stuffed with pitted dates. But the others in our family do not like them stuffed. Oh gosh, Chennette, yuh talking my thing. Sorry for being a bad fellow blogger recently. I see you tagged me in your post about weird food facts. Is it too late to answer? never too late – I’ve been offline alot in the past month, so I didn’t get to follow up properly on these things you’re still welcome to join in! Someone’s offering to share kurma? They do that at weddings and stuff. In little bags all prettied up. When next I wing my way to Jamaica I’ll make sure I walking with some kurma. So gulab is really what I does fat ‘kuma’? I thought that was what yuh call the cockset looking yellow sweet. Is it made from the same ingredients as kurma? Cause it taste kinda the same, except a little richer. Yuh kinda confuffle on that one. I came across your recipe and i absolutely love it. The Gulab Jamoom was nice and rich and everyone enjoyed it. Hi Julie – glad you liked it and reported back Thanks for visiting! yes yes i know i am kinda late on this one, but i have been eating a lot of the ‘real’ gulab jamoon lately So right now that is like my flavor of the month, cause it so reminds me of the taste of the fudge we’ does make that i used to have growing up. 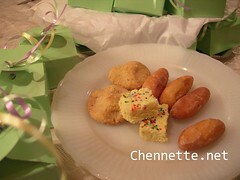 But i was just wondering if we have that or anything similar to it in Trinidad cause i can’t remember having anything sweets like that except for that yellow cockset looking thing? yellow cockset=jelebi, which is sugar fried and soaked in syrup ok, not completely sugar, but that is what it tastes like! 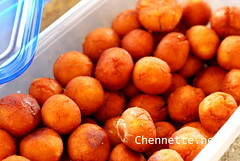 as for the real gulab jamoon – fried dough in syrup, we make a ras goolah – fried balls of milk powder soaked in syrup. The spices might differ though a little in the taste. Or that is what you call it; jelebi…..sound like chili bibi…….thanks. But i though gulab jamoon was made with cheese? ras goolah sounds delicious, is that the same as ras mulah? Umar boy, I think we reaching the stage where I need to see pictures of what you calling these things 😀 gulab jamoon in Trinidad is just fried sweet dough. Gulab jamoon the “real” Indian sweet, is a soft fried milky dough in a sweet syrup (so it will be brown). Ras malai is made from balls of the paneer or cheese in syrup/cream, and is therefore white. I was actually looking up the fruit called the Gulab Jamoon. It must be a nickname applied by the early Indians in Trinidad to that purple grape like fruit called “Gulab Jamoon” These trees grow along the rice areas and sometimes form the boundaries of people’s lands. The fruit is eaten when very ripe or it leaves a very “cassa” taste to the mouth. Its great in chow and can also be used to make fruit wines. I would still like to know the Latin and English name of the plant and fruit. I have had some real nice Gulab Jamoon (the ones you make). I have a sweet tooth and like it when it is drowned in that nice sweet syrup. I just read all the blogs from way back in 2007 until present. I am now very hungry for some of those delicious offerings you all spoke of. I cannot cook any so I will need to run out and buy some, but wait! These delicacies are not available for sale just anywhere!!? Then I will have to kill the desire upwelling in my mouth and wait until Sunday when I can get some Jilabee and Barfee etc in the market. Then I have to wait until Eid to go by my family and secure my share of the goodies!!! Hi there..its nice to see someone from Trinidad trying to diffrentiate between the Indian and Trini versions of ras goolah and gulab jamun. You’ve done a good job but I beg to differ about jelebie being fried sugar…its not even a close description of what it really is. Its a soft flour mixture..almost runny..left to curdle with lime juice or dahee/yougurt then piped in hot oil and soked in paag. Keep up the good work! Hi angenie – I know there’s more to jalebi when I was young it was sooo sweet I assumed it could be nothing more than sugar! Hi …I just want to thank you for this wonderful recipe….I must say I tried it three times already and all came out amazing and scrumptious.. Really great recipe keep up the good work…. Hello and welcome Haleema! So glad the recipe has consistently worked out 😉 My mother will be happy we are propagating her recipe. I love your recipes…tried the goolab jamoon it tasted great…thanks for sharing..
Hi Reshma, the weight is more accurate we always weigh. Cup measurements for flour vary too much depending on British or US, humidity, method of filling the cup etc. I gave a cup as a possible guide but rely on the weight.